Linear Equations with Two Variables - Theory, Solved Examples & More! You are very much familiar with linear equations in one variable which can be represented in generalized form as “ax = b” where a, b are constants and x is a variable. Since in the above equation, there is only one variable “x”. The degree of this variable is one as you can see, thus, the equations of this sort are called linear equations is one variable. In a similar way, when an equation is having two variables with every variable in first degree such that variables are not multiplied with each other then it is called as a linear equation in two variables. In generalized form it can be written as ax+by = c where a, b, c are constants and x, y are variables. Now, it is too obvious that solution of this equation i.e. values of x and y can’t be evaluated with the help of this single equation. That’s why we always call for the linear system with two variables because there must be two equations in same variables to get a solution otherwise the value of the one variable will be in terms of another variable. So, to solve linear equations with two variables a number of methods are available which we are going to discuss now. Before getting into details of graphing linear equations and solving them we will learn some concepts about graphs. To specify the location of a point uniquely in a plane, two mutually perpendicular number lines are laid down such that their zeroes coincide. These are called as rectangular axes. This combination of plane and rectangular axes is known as a Cartesian plane. So, this plane is the place where we are going to plot given linear equations in order to find a solution. The horizontal number line is known as X-axis and the vertical number line perpendicular to the horizontal one is called y-axis. The point of intersection of the two lines perpendicular to each other is called origin. These two perpendicular number lines divide the two-dimensional plane into four different regions which are called quadrants. By convention, these quadrants are numbered as I, II, III, IV in the anticlockwise direction. In the I quadrant, both x-coordinate and y-coordinate will be positive. 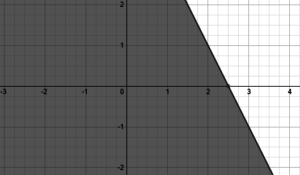 In the II quadrant, y-coordinate will be positive while x-coordinate is negative. In the III quadrant, both x-coordinate and y-coordinate will be negative. 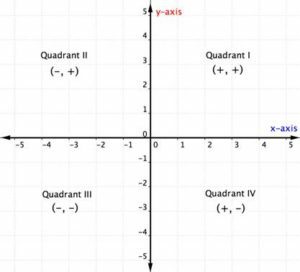 In the IV quadrant, x-coordinate will be positive while the y-coordinate will always be negative. Now, when we know some basics of graphs we should head towards learning the main topic which is finding a solution using the graphing method. So, many times we have used word “solution” but what does this word means here? A solution of a system of linear equations in two variables is an ordered pair which satisfies both equations. The system of linear equations may be consistent or inconsistent. Suppose the two variables given are x and y, and the linear equation is ax + by = c. Then to graph the equation, we can take any random values of x, fit those values in the equation to get the corresponding values of y. After getting the coordinates for (x, y) the graph can be plotted by joining the points. Using this method you can plot the graph of one equation. In the same way, you will plot a graph of another equation on the same plane. Since the equations are linear therefore plotted graphs will be a straight line and if both the straight lines corresponding to each equation are intersecting at a point then they are said to have unique solution and system is said to be consistent and point of intersection is the solution to equations. If both the straight lines are parallel then, the system has no solution and system is said to be inconsistent. Let us try an example to understand this better. Ans: Plot graphs of given equations and after plotting you will find one point of intersection in the graph which is the solution to the equations. You can also cross check by putting this value of (x,y) in the given equations, it will be satisfying both equations. In this method, we will solve one of the equations for one of the variables which will be in terms of other variable and substitute this into the other equation. This will result in one equation with one variable that we can solve. Once this is solved we substitute this value back into one of the equations to find the value of the remaining variable. Let’s understand this method with the help of few examples. In this method, we multiply one or both of the equations by appropriate numbers (i.e. multiply every term in the equation by the number) so that one of the variables will have the same coefficient as in other equation with opposite signs. Then, the next step is to add the two equations together. Since one of the variables is having the same coefficient with opposite sign it will be eliminated when we will add the two equations. The result will be a single equation in one variable that we can solve for one of the variables. Once this is done substitute this answer back into one of the original equations to get a value of another variable. This method will be more clear with the help of few examples. Multiply (1) with -2 and add both equations. When inequality symbols are used in linear equations they become linear inequalities. The symbol “=” is used to denote equality and symbols “<“, “>”, “≥” and “≤” are used to denote inequality. Method to solve linear inequalities is somehow different from above-shown methods to solve a linear equation. We will try to understand this with the help of an example. Draw values table for 2x + y = 5 and plot the graph. Since our test point (0, 0) made our inequality true. So, the solution lies towards the origin. Shade in the answer to the inequality. Gray colour indicates the final answer. Eg: Five times a larger number added to two times a smaller number is fifty. The difference between the two numbers is 10. Find both numbers. The Smaller number is 0. This was all about Linear Equations with Two Variables.